"Swap meet" redirects here. For CSI episode, see Swap Meet (CSI). For other uses, see Swap meet (disambiguation). Flea market vending is distinguished from street vending in that the market itself, and not any other public attraction, brings in buyers. Many flea markets have food vendors who sell snacks and drinks to the patrons. Some flea market vendors have been targeted by law enforcement efforts to halt the sale of bootleg movies and music or knockoff brand clothing, toys, electrical goods, accessories, or fragrances. Different English-speaking countries use various names for flea markets. In Australian English, they are also called 'trash and treasure markets'. In Philippine English, the word is tianggê from the Nahuatl tianguis via Mexican Spanish (despite common misconception, it is not derived from Hokkien), supplanting the indigenous term talipapâ. In India it is known as gurjari or shrukawadi bazaar or even as juna bazaar.. In the United Kingdom they are known as "car boot sales" if the event takes place in a field or car park, as the vendors will sell goods from the 'boot' (called "trunk" in American English) of their car. If the event is held indoors, such as a school or church hall, then it is usually known as either a "jumble sale", or a "bring and buy sale". In Quebec and France, they are often called Marché aux puces, while in French-speaking areas of Belgium, the name Brocante or vide-grenier is normally used. In Switzerland the Swiss German language term Flomärt, for example for the well-known Bürkliplatz-Flomärt is used, being a variation of the Allemanic word of Flohmarkt, meaning literally "flea market". In the predominantly Cuban/Hispanic areas of South Florida, they are called [el] pulgero ("[the] flea store") from pulga, the Spanish word for fleas. While the concept existed in places such as what are now India, Bangladesh, and China for millennia, the origins of the term "flea market" are disputed. According to one theory, the Fly Market in 18th-century New York City began the association. The Dutch word vlaie (also spelled vlie, meaning "swamp" or "valley") was located at Maiden Lane near the East River in Manhattan. The land on which the market stood was originally a salt marsh with a brook, and by the early 1800s the "Fly Market" was the city's principal market. Another theory maintains that "flea market" is a common English calque from the French marché aux puces (literally "market of the fleas"). The first reference to this term appeared in two conflicting stories about a location in Paris in the 1860s which was known as the marché aux puces (flea market). 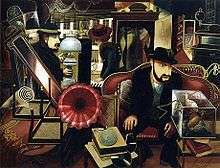 The traditional and most-publicised story is in the article "What Is a Flea Market?" by Albert LaFarge in the 1998 winter edition of Today's Flea Market magazine: "There is a general agreement that the term 'Flea Market' is a literal translation of the French marché aux puces, an outdoor bazaar in Paris, France, named after those pesky little parasites of the order Siphonaptera (or "wingless bloodsucker") that infested the upholstery of old furniture brought out for sale." ↑ "Flea market". Dictionary.com. 1998. Retrieved February 12, 2012. ↑ "What is a flea market?". Conjecture Corporation. Wisegeek.com. 2003. Retrieved February 12, 2012. ↑ "Americana Resources Inc. (2008, October 20)". Flea Market Directory – Uniting the Many Worlds of Collecting. Collectors.org. Retrieved February 12, 2012. 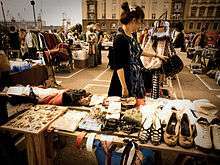 ↑ "How to Become a Flea Market Vendor". StyleCareer.com. Afton Institute, LLC. 2008. Retrieved 2008-09-13. ↑ Mitchell, Bob (August 21, 2007). "Police bust nets $800K in pirated DVDs". TheStar.com. Toronto Star. Retrieved September 13, 2008. ↑ Roberts, Bob (December 17, 2005). "Swap-O-Rama Raid Spoils Christmas Shopping For Bootleg Recordings". WBBM Newsradio 780. CBS Radio. Retrieved September 13, 2008. ↑ Hernández, Paloma Albalá (2007). Americanismos en las Indias del Poniente: Voces de origen indígena Americano en las lenguas del Pacífico. Lingüística Iberoamericana. IX. Vervuert. p. 171. ISBN 9788495107527. ↑ "Tagalong Lang". Tagaloglang.com. Retrieved 2013-02-09. ↑ "History Blog Insight into History – A Weekly Instrospective Into The Past". Archived from the original on 21 March 2012. ↑ "Flea Markets in Arkansas". Arkansas Arts and Crafts. Arkansas Department of Parks & Tourism. 2006. Retrieved 2008-10-11.